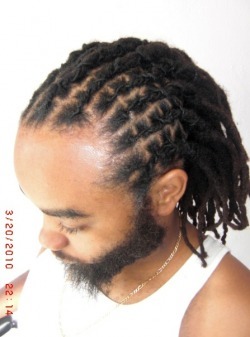 2- To Re-attach half of the head with Dreadlocks price start from: $120.00 and Up. 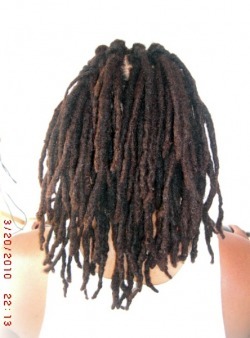 When this procedure is done you will be very happy with the outcome of your Dreadlocks. This process can take from 3 hours to 2 days. 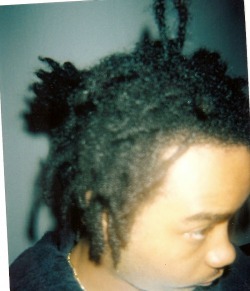 The dreadlocks was only 2 years old. The above pictures were taken 2 years ago, just to show before and after. He is a client since 2007. 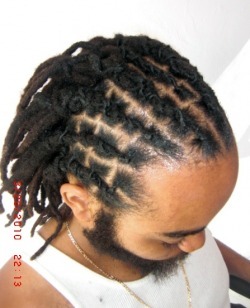 Were taken in 2007, is to show before the dreadlocks was twisted and after the dreadlocks was twisted and styled. is to show the beginning of the Re-attachment process and the end process/styled. 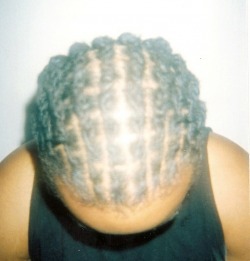 This Dreadlocks was badly damage therefore the front Locks pop. 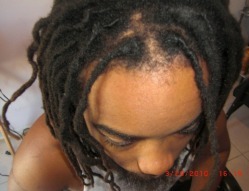 The new growth and the locks has to be Re-attach together. 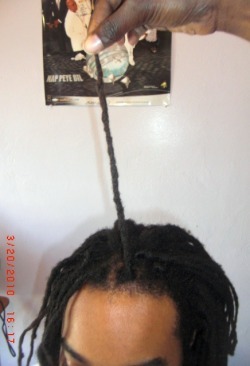 As a result, his new growth and the Dreadlock will grow as one. 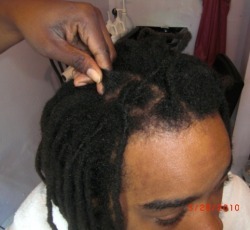 Once the Re-attachment process is done, this client can be 99.99% that his dreadlocks will NOT fall off from his head. In this picture you can see that I am holding his new growth to the left side and the Locks is on the right. I'm getting the hair ready for Re-attachment process. 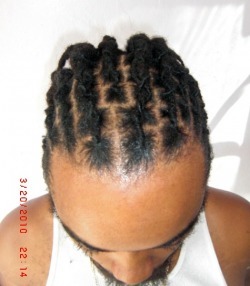 The front Dreadlocks fell of his head. In this picture you will see that he does not have his dreadlocks on the front head. Look at the following pictures so you can see the transformation of the Re-attachment. This picture shows you the side view of the head therefore you can have a better look at the badly damage hair. 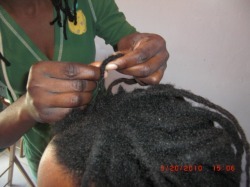 When it comes to Dreadlocks no matter how damage is the locks or your roots, it canALWAYS be fix. On the left side I'm holding the locks just to show you how it looks before the Re-attachment and on the right side I'm holding the new Growth. Keep on watching the following you pictures therefore you can see the entire process of the hair and locks being fix. 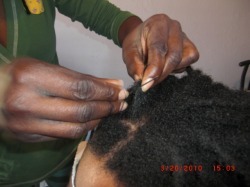 The new growth and the locks has to be sewed in therefore your new growth and your Dreadlock with grow as one. 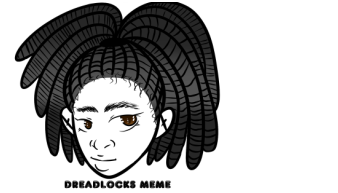 Once the Re-attachment process is done, you can be 99.99% that your Dreadlocks will NOT fall off. The Re-attachment process can take from 30 minutes to one hour only if it's a couple of Locks that need to be Re-attach. To Re-attach the entire head, that process will take from 12 hours to two days. 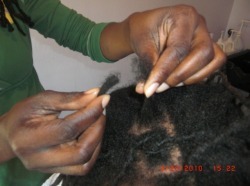 Is all depend on the condition of the Locks, Scalp and the Size of the Dreadlocks at the root. 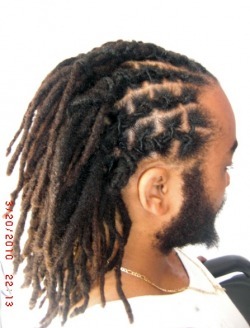 If the Dreadlocks is smaller the re-attachment process will take longer to accomplish. The Re-attachment is almost done, keep on viewing the following pictures for the final Style. After that one Lock was Re-attached. Keep on viewing the following pictures. One lock is held up to show how it look after the re-attachment. The Re-attachment process is done and now the Dreadlocks is ready to be styled. 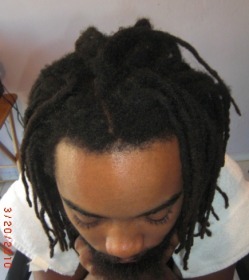 As you can see in this picture the front of his hair is Re-attached, and his entire roots is fixed and styled. 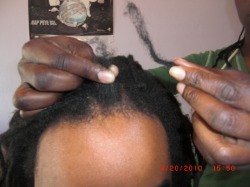 This picture is to show you there is hope for badly damaged Dreadlocks. There is always hope, for damaged Dreadlocks. As you continue looking at these final style pictures you will see how nice the Dreadlocks look and you will not see any thread on the dreadlocks.. The Re-attachment is all Done. 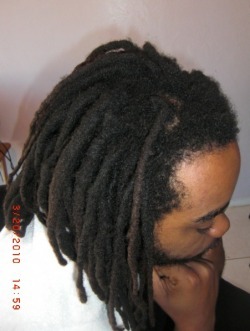 The back of the Dreadlocks, It's Neat and Healthy. Re-attachment and Style process is all done.